“Oh, Aslan! !” said Edmund and Lucy both together in despairing voices. The end of one adventure is often the beginning of another. For me, there was the end of a good career and good health and the beginning of the battle against cancer. While not the adventure I had sought, it has not been without certain revelations I may have missed elsewhere. Then there was the end of the cancer (for now at least) almost a year ago and the beginning of a new life with new stem cells and all the blessings and trials that come with that. There is for each of us the end of the adventure of life as we know it and the greatest adventure of life after death! Imagine a new year being decidedly content and fully satisfied with God’s plan being unveiled in your presence, day by day. Imagine living by faith with reckless abandon the adventure to which he calls you. Don’t shy from it despite your pain, your doubts, your regrets, or your fears. Embrace this new year as a gift to be fully explored and enjoyed. This entry was posted in A Life of Adventure, Faith, Leukemia/Cancer, Living With Purpose and Passion, Relationships and tagged A time for everything, Aslan, Behold I am doing a new thing, CS Lewis, Forget the past-press on to what is ahead, Fully satisfied, Isaiah 43:18-19, Leukemia/Cancer, Living the new adventure, Lucy and Edmond, Narnia, Philippians 3, Reckless abandon, stem cells, Voyage of the Dawn Treader on December 31, 2013 by Bryan Thayer. Have you been struggling for some time with a particular problem or sin, only to find that your efforts are never sufficient to bring resolution to your problem? Are you thinking, here comes yet another year of hopeless struggle? Do you need a gift of hope today? What an incredible verse of hope for us! God’s decision to grant mercy is not based on my goodness! I remember visiting with a gal several years ago about this. She just could not grasp the truth of this statement: No one can go beyond the reach of God. There is no limit to his grace that any of can exceed. There is always room at his feet to receive mercy. (That’s why it is called Amazing Grace!) You may think you are not good enough, you’ve done too much wrong and not enough good. You are probably right, but that doesn’t limit God’s ability to forgive and to grant you grace. Where is our hope? It is in turning away from our futile self efforts and asking God to guide us. It is in seeking his presence not just to solve a problem but to enjoy being with him. In his presence you will find mercy, love, and real hope. “Come, let us reason together, says the Lord: though your sins are like scarlet, they shall be as white as snow; though they are red like crimson, they shall become like wool” (Isaiah 1:18). This entry was posted in Faith, Relationships and tagged Amazing grace, come let us reason together, Exodus 33:19, God will have mercy on whom he has mercy, Hope for the hopeless, Isaiah 1:18, John Piper, Never beyond God's reach on December 30, 2013 by Bryan Thayer. Terrible, horrible, no good day? Yesterday, I wrote about the importance of enjoying today as a gift from God. And it is true! But if we are honest with ourselves we will admit that some days we just don’t feel like it’s a gift. In fact some days seem down right crummy, don’t they? Some days feel like WE are Alexander in Judith Viorst’s 1972 children’s classic, “Alexander’s Terrible, Horrible, No Good Very Bad Day.” Do you remember? He wakes up with gum in his hair. He trips on a skateboard. At breakfast his brother gets the prize in the cereal box and all he gets is cereal. At the dentist office he finds out he has a cavity. He gets in trouble all day long and nothing goes his way. He has to eat lima beans for supper. He hates lima beans. He gets soap in his eyes at bath time and loses his marble down the drain. And to make matters worse the family cat wants to sleep with his brother, not him. He concludes that he wants to move to Australia. His mom tries to assure him that everyone has bad days, even the people who live in Australia and that tomorrow is a new day. It’s a children’s story for sure, but one with a message for us adults. Your crummy days may deal with a lot more serious thgs. But think about it: how many of the crummiest days in your life have you made it through so far? ALL of them, right? A 100% track record like that is reason to give thanks and to have hope for today and tomorrow. God is good to never leave us and he sees us through even the crummiest days. Seek his presence and find strength and courage for even the crummiest of days. This entry was posted in Faith, Living With Purpose and Passion and tagged Alexander's Terrible Horrible Day, be strong and courageous, Crummy days, Deuteronomy 31:6, Do not be afraid, God will never leave you on December 29, 2013 by Bryan Thayer. – Seeing all my family on one day (one via Skype video call to South Korea). – Loving others and being loved unconditionally. – Remembering again that the most important things in life aren’t things. “Yesterday is the past – learn from it. Tomorrow is the future – prepare for it. We are advised to not dwell in the past, but it’s good and profitable to visit it long enough to glean important lessons learned. One of the lessons I’ve learned (again) this past year is how futile it is to spend too much time preparing for the future since we have no real control of it and it changes so drastically. Still, it seems prudent to invest in the future, particularly by building and exercising your faith today. How in the world would we have drawn on our faith to sustain us through this first year with Leukemia if we had not made a great many faith ‘deposits’ when life was less perilous?! What is the gift of today? It is being fully awake and aware that time marches on and waits for no one. It is being aware of who God is and who we are in his sight. It is an adventure to be lived, a treasure hunt for the blessings God intends for you to discover and enjoy and share with others. Today is intended to be unwrapped and enjoyed. It is a day for giving thanks, remembering the ways you have been gifted in the past. It is a day for putting an end to things that hurt you and others! It is a day for forgiving. Today is for giving up trying to control the future or worry about it and to give up things from the past that enslave you. It is a fresh opportunity to enjoy God’s presence. Today is a gift. Enjoy it fully. This entry was posted in Faith, Living With Purpose and Passion, Relationships and tagged gifts, Matthew 6:33, Seek first his kingdom, The best things aren't things, Today is a gift, Yesterday Today + Tomorrow on December 28, 2013 by Bryan Thayer. We enjoy Christmas decorations. I especially enjoy seeing post-Christmas candles in the windows of homes around town. Of course, now a days they are electric candles but seeing those little beacons shining into the neighborhood reminds me of our “Christmas is every day” mission. It is the mission of GLOW to see His light shine in the darkness to remind people where they can turn for real peace and joy. We didn’t have any Christmas decorations this year or last. Since we thought we were moving soon for mission work in Bolivia we sold all our decorations, except Marcia’ parents’ old nativity set. Years ago when the family was at home we would typically take down Christmas decorations on or about New Year’s Day. But we would keep up the nativity set for a little longer. Many theologians agree that the Magi didn’t arrive to see Jesus until he was 1 1/2 or two years old in his house in Bethlehem. So we would arrange the Magi figures away from the nativity set acknowledging that the wise men were still seeking him over a very long and arduous journey. Can you imagine such determination?! Did you know that wise men (and women and boys and girls) still seek Jesus today? Through difficult journeys in their lives, when it seems that the hope of joy has escaped, wise men still seek him. Day after difficult day. Year after trying year. They still bring valuable gifts to him, perhaps the most valuable of is their faithful pursuit of the King of Kings and the praise and adoration they give him. Wise men still seek him. Do you? This entry was posted in Faith, Living With Purpose and Passion, Memories and tagged Christmas candles, decorations, Magi, nativity, wise men still seek him on December 27, 2013 by . How was your Christmas? Good? Everything you wanted? Amidst the hustle and bustle that often occurs over the holidays, did you encounter Jesus and find the peace and joy that only he can offer? We did, in the hectic portions of the celebrations and the quiet moments. One such quiet moment that brought great joy to my heart was seeing the pictures of the children from our mission in Bolivia. Some of you might not know that Go Light Our World (GLOW) is not just a daily inspirational blog but also a 501c3 nonprofit ministry that supports other ministries in the USA and across the globe. Currently, 100% of donations (Select DOnate from upper menu) go directly to the mission field to promote literacy, improved health and nutrition, and opportunities to experience worship and celebrating life together in Jesus’ name. 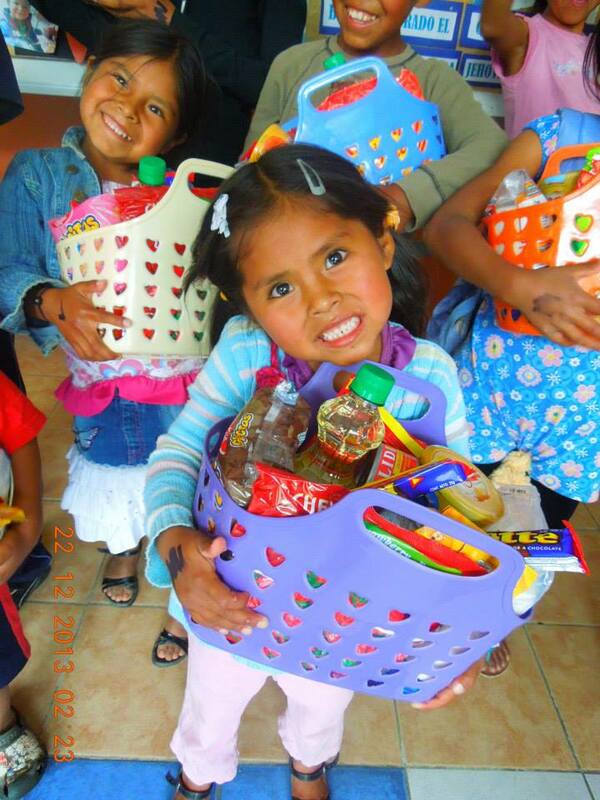 We also sent funds to purchase Christmas gifts for children who would otherwise have few or none. Their grateful hearts make the giving all the more enjoyable. But that’s not what struck our heart. 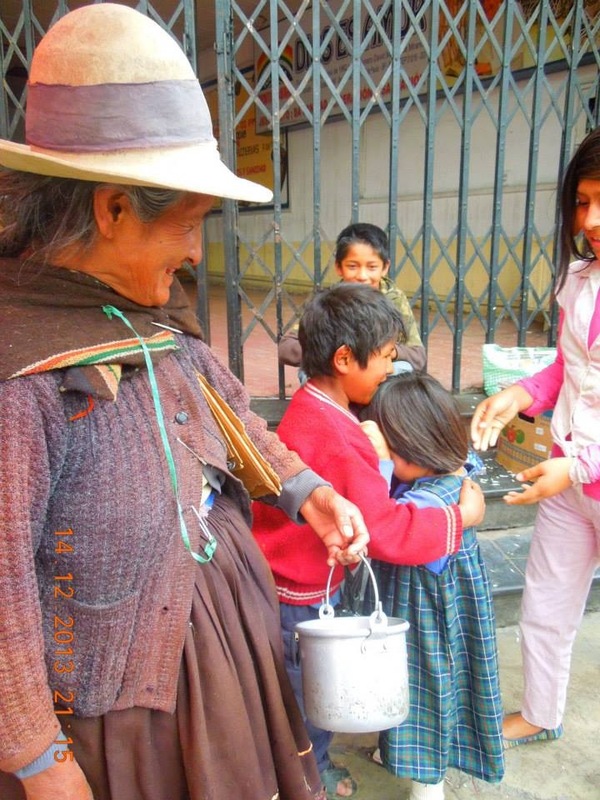 It was seeing the children being taught to give to others out of their poverty. 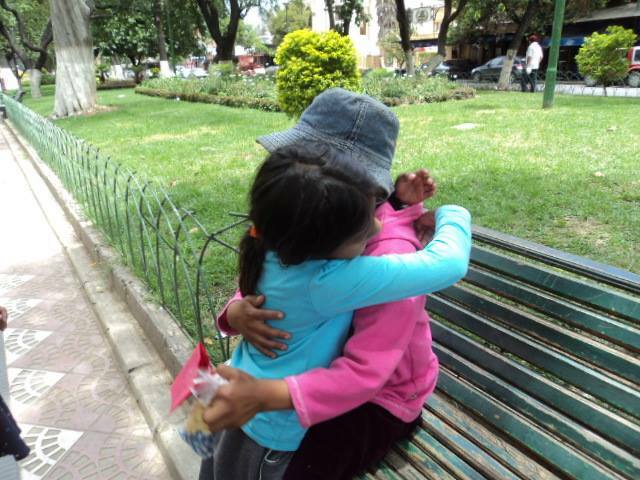 The leaders took the children into the streets where they found children who had even less than they did. And they gave them gifts…and hugs. That is what spoke to my heart and why I am so excited about this little mission in Bolivia. It reminds me that if we have Jesus in our heart, then others ought to see at least a glimpse of him in our lives. They should see instruments of peace and love and joy. Here is to letting His light shine though us in the simple gestures of our lives. Here’s to celebrating Christmas every day! 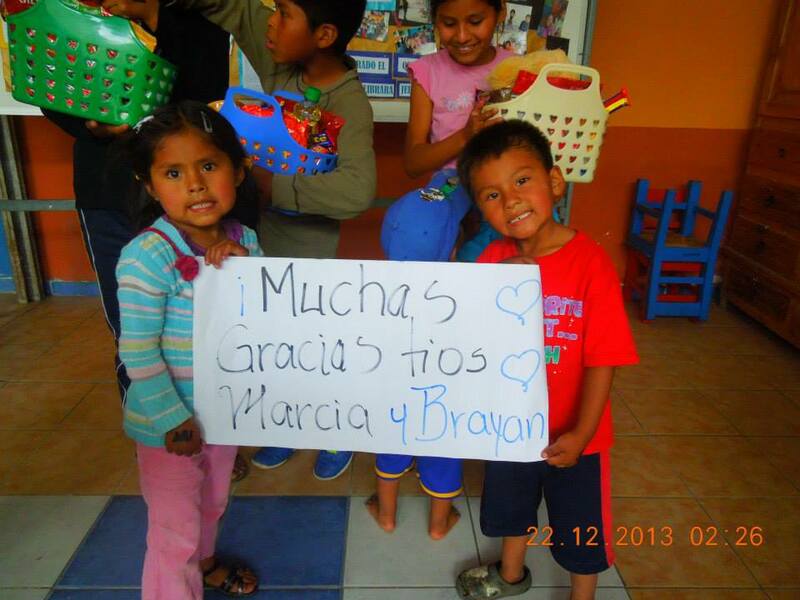 This entry was posted in Bolivia, Faith, Living With Purpose and Passion, Relationships and tagged Bolivia, Celebrate CHRISTmas, giving is better than receiving, seeing Jesus in us on December 26, 2013 by . Peace is discovered when we experience harmony and balance. Many people find a sense of this in nature. Taking a walk in the woods, making “snow angels”, enjoying solitude by the sea, staring at a starry night… what is it about participating in nature, God’s creation, that brings such peace and joy to our soul? Part of that answer may be because we are designed to experience things which are larger than us. Nature is such an expansive reminder. It pulls us away from our worldly concerns. It places our life in the perspective of the cosmos and all of God’s eternity. The bible adds to that perspective by reminding us that even if we choose not to draw close to God or celebrate his goodness, even the heavens and nature will praise him. How is it that rocks and trees know to praise God yet we have such a tendency to be distracted from that very purpose for which we were created? You can reclaim that sense of purpose. You can reclaim that joy. In everything you do, join the heavens and nature in singing and proclaiming the goodness of the Lord. Celebrate his faithfulness and his tender mercies. Acknowledge him in all you do and he will show you the path that leads you to a very merry Christmas! This entry was posted in Faith, Living With Purpose and Passion, Relationships and tagged acknowledging God, Christmas, heaven and nature sing on December 25, 2013 by . The Bethlehem story of there being no room at the inn may be a shadow of things to come. In a busy world where real Christianity is pushed aside to make room for traditions, holiday shopping, and decorations, we might ask if there is room for Jesus today. We are encouraged in the hymn, Joy To The World, that every heart should prepare him room. But how do we do this when there are so many pressures on us, so much to get done before Christmas Day?! “Did we spend enough? Did we spend too much? I thought we weren’t going to get caught in that trap this year!” Someone even shared a photo with me of a store display. (I believe yesterday Dec 23.) Normally, on Dec 23 you would expect to find Christmas decorations and wrapping available. 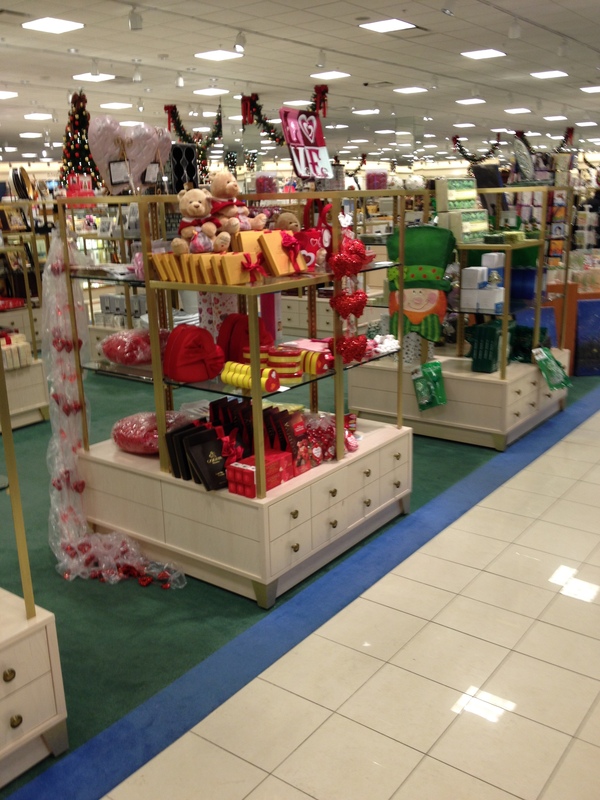 But no, this store though it urgent to get out the Valentine and St. Patrick decorations…BEFORE Christmas even arrives! Sound familiar? No wonder more people become depressed this time of year than any other. Simplify – Make a list of everything you think you have to do before Christmas. Then ‘check it twice’ and cross off all the things that really aren’t necessary to a real Christmas celebration. Plan – Instead of running aimlessly from one activity to another, and getting worn down in the process, plan ahead. Recruit others’ help in getting things done. Share the joy! Focus – Reserve time for quiet times of thanks, for experiencing the peace and joy that God intends for you to discover in being still, to cease from doing and simply enjoy his presence and the gift of friendship. Ponder his Word, especially the true Christmas story in Luke chapter 2. Experience how very much God loves you. This entry was posted in Faith, Living With Purpose and Passion, Relationships and tagged 1 john 3:1, Children of God, Prepare him room on December 24, 2013 by . Have you received God’s gift? And if you have, are you enjoying the gift of Jesus fully throughout the busyness of your days? He is the very source of our greatest joy, this Christmas and beyond. This entry was posted in Faith, Living With Purpose and Passion, Relationships and tagged John 1:12, Joy to the world, Let earth receive her king!, Receiving the gift, the Lord has come, to those who received and believed he gave the right to become children of God, Unopened gifts on December 23, 2013 by Bryan Thayer. Without doubt, one of the most beloved Christmas hymns, “Joy to the World,” continues to inspire us to the hope for a joy that transcends the earth. . . The sense of everything else being held in the suspension of time so we can experience the essence of real joy. What does this joy look like to you? Is it the return home of a relative or friend you haven’t seen for a long time? Is it all the presents under the perfect decorated tree? Is it finally the ceasing from buying and decorating all those presents? Maybe to you the joy is found in giving and receiving those presents. While there may be certain happiness found in all of those events, the song speaks of a different joy, one that came to all the world and that surpasses all the other earthly joy, the reason we celebrate Christmas: this is the joy that God has come to earth in human form to rescue us from our sin. Now THERE’S a gift we can celebrate! I hope you don’t miss any of the joy that Jesus desires to bring to your Christmas! This entry was posted in Faith, Living With Purpose and Passion, Relationships and tagged Jesus is the joy bringer, Joy to the world on December 22, 2013 by .